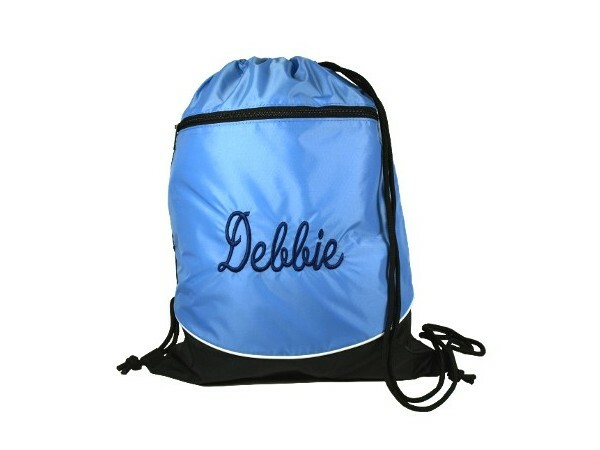 Blue Monogrammed Drawstring Backpack-Front Zip pocket. From running errands, to a trip to the gym or hauling laundry from the dorm to the laundromat, our Blue Monogrammed Drawstring Backpack will make life easier! The shiny nylon material makes it easy to clean. To make it uniquely you, add your Name, initial/s Monogram, or even an Initial Applique, made from your choice of design. Drawstring closure that creates backpack shoulder straps. Shiny Nylon material for eash clean-up. Dimensions - 14" x 8"